How Soccer Helped Unite A Fractured Refugee Community In Uganda : Goats and Soda When Robert Hakiza was a boy, he used to play soccer with kids regardless of their ethnicity. Could the sport help cut through ethnic tensions at a refugee camp in Uganda? Robert Hakiza, who started a soccer tournament to unite refugees in Africa, sits on a bench in Washington, D.C.
Robert Hakiza remembers running to his uncle's house, finding his sandal first and then his bloodstained body heaped on the ground. Uncle Boniface had been an anthropology professor who lectured at universities in the eastern part of the Democratic Republic of Congo and across the border in Rwanda. He had taught Hakiza, then a teenager, to love school in their Congolese city of Bukavu. But political turmoil and ethnic tensions were on the rise. One day in 1996, rebels killed Boniface because, Hakiza says, he looked Rwandan. They thought he was a spy. The following year, President Mobutu Sese Seko was ousted and a brutal war that involved multiple African countries ensued. Daily life became so dangerous that Hakiza's parents told him he should stop going to school. He chose to honor his uncle by continuing his studies, earning a degree in agriculture from the Catholic University of Bukavu before fleeing with his family in 2008. His father, a mechanic who fixed cars for the Rwanda-supported regime that had since taken control of their area, learned that he had been put on a list of people to be killed. "We decided to leave to save our lives," Hakiza says. Yet even in Uganda, living in a small apartment with exiled neighbors, Hakiza saw how refugees carried their enmity for different nationalities and tribes across state lines. Those tensions weren't always in Congo. Hakiza remembers that when he was 6 or 7 and kicking around a soccer ball, everybody played together and nobody cared about what made them different. "I can't really say that I was good at it," Hakiza says of the sport. But years later, it took on new meaning for him. Hakiza decided to start a soccer tournament with refugees in the Kampala community. "We wanted to try to create the same situation as before, as it used to be before the war" — people playing together regardless of their identities. Congolese, Rwandans, Burundians and Somalis signed up, forming eight teams. The tournament took place in April 2008 and drew such a positive reception that Hakiza founded the Young African Refugees for Integral Development (YARID) with friends later that year. At first, the founders just tried to get people to play soccer together. When they needed money, participants would pitch in to help buy supplies. A single team composed of diverse nationalities eventually formed and started competing in a soccer league. Today, YARID's programs include sports for development, job preparation and placement, and a center for technology and innovation. The idea for some offerings, like English classes, formed after soccer games as players described their language barriers. In 2016, the organization received a $100,000 Ockenden Prize for a program that teaches women self-sufficiency. It offers women vocational training and gender-based violence awareness classes. Hakiza, YARID's executive director, says the organization has provided help to 3,500 refugees. The 33-year-old has also interned at the United Nations Food and Agriculture Organization and worked as an assistant researcher in Uganda with the University of Oxford. He was chosen to speak at a Moth storytelling event in Washington, D.C., as part of the Aspen Institute's New Voices Fellowship. "Robert's is a quieter voice. He rarely seeks the spotlight, and I believe it is precisely those voices that should be heard," says Rachael Strecher, the fellowship program manager who helped select him. 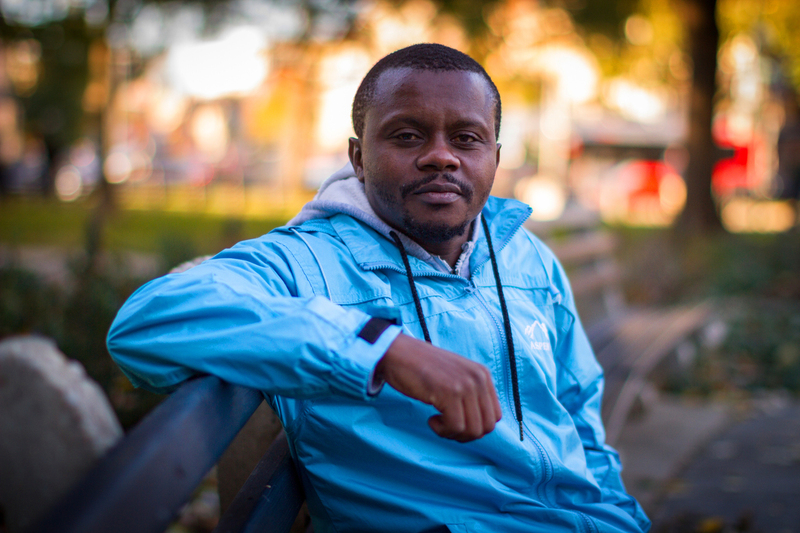 From a hotel in Virginia, Hakiza told NPR about the difficulties he faced in Congo and how soccer helped unite a fractured refugee community in Uganda. This interview has been edited for length and clarity. What was Bukavu like before you fled? It's a small city close to Rwanda. We grew up with so many people from Rwanda at that time, we did not even know they were from Rwanda. We had people from different cultures and tribes. I remember especially when the situation was getting worse, music was one of the things that people could use to console themselves to forget what was taking place. Most of the songs are in Lingala, a local language which is partially spoken in the Western part of Congo. What did you aspire to be in those younger days? When I was at secondary school, I wanted to be lawyer. But this changed when I was about to finish secondary school. I started developing the idea of doing agriculture. There was a perception, whenever people talked about agriculture, that it meant you're spending most of your time digging — they couldn't necessarily look at it as science. You said in your Moth story that you faced obstacles in attending secondary school in Congo. People my age, we stayed home for a full year. The teachers decided not to teach because they were not paid. Also I remember there was a time when we were stuck at school, for I think almost three days, because people were fighting outside with guns. They just put us in one hall within the school. You could get food just once a day, something very small to sustain us. When you arrived in Uganda, how did the tensions between refugee communities manifest? The tension I talk about, it was really a cold one. It was very difficult to find a Congolese together with a Rwandan or a Burundian. The Congolese were here in one place, and the Burundians were on the other side. And whenever you talked to the Congolese, they didn't want to hear about Rwandans — looking at the role Rwanda played when the war started. Why did you feel that soccer, a competitive sport, would unite people? Soccer creates that spirit of team. It's very difficult to find a team that is made up of people of only one tribe. Most of the time it's people coming from different tribes, even different nationalities. Though we have two sides, at least when you are in a team you have a number of people who are fighting for the same goal. They become one. That is the most important thing. Can you talk about a refugee that your organization, YARID, has helped? After six months in Uganda, I started teaching English. In my class, we had a lady also from Congo. She was just there physically. Sometimes you could see her crying, see the tears flowing on her cheek. Back in Congo, her husband was killed just a week after their wedding. One evening, these rebels came to their home, they killed her husband and they raped her and also a cousin who was staying there. When she completed the English class, that is when we had come up with another program to empower women so that they could start coming up with activities to earn an income. We had sewing machines and also a trainer. I took the lady to join the class. There was a volunteer who came from America who was touched by her story and who helped her out with a sewing machine. She started making clothes, and she managed to start getting some money. The money helped her to rent a two-room house. And she managed to send for the cousin — the one who was raped — and she started to go to school. Right now she got married to another man and she's very happy. Just wondering. Do you still play soccer? At least every Saturday morning. I can't stop. Sasha Ingber is a multimedia journalist who has covered science, culture and foreign affairs for such publications as National Geographic, The Washington Post Magazine and Smithsonian. Contact her at @SashaIngber.